BC offers an I-Beam style connecting rod for those who prefer that traditional design over the H Beam style. The I-Beam is a proven configuration that is very popular among the forced induction crowd. Features 7/16" ARP2000 bolts standard, This is the ultimate connecting rod for boost and/or nitrous, rated in excess of 225HP per cylinder. The BC Brian Crower ProSeries-H connecting rods are made from premium 4340 forgings for improved grain flow and added strength. Feature the BC Heavy-Duty design with added material to the big end housing bore and wrist pin area for added horsepower capability. The BC ProSeries-H Heavy-Duty features ARP 7/16" fasteners for the ultimate clamping ability, while the ProSeries-H LightWeight features ARP2000 3/8" fasteners. BC Pro Series design connecting rods are CNC machined from proprietary aluminum alloy that delivers up to 24% more tensile strength than competing alloys. Incorporates 7/16" ARP fasteners. 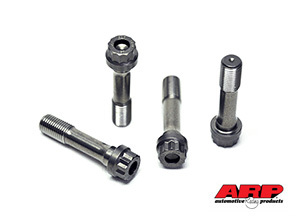 BC Brian Crower is proud to feature ARP, the premier manufacturer of high quality fasteners, in every BC connecting rod. ARP rod bolts are superior to those from other manufacturer�s, especially in the area of fatigue strength. Testing has shown that ARP rod bolts have ten times the fatigue strength of other fasteners. These fasteners are also available for purchase separately for replacement purposes. ARP2000 � an exclusive, hybrid alloy developed to deliver superior strength and better fatigue properties, capable of achieving a clamp load of 220,000 psi. ARP Custom Age 625+ - Newly formulated super-alloy demonstrates superior fatigue life cycle, tensile strength and toughness, with complete resistance to atmospheric corrosion and oxidation. The Custom Age is ARP�s ultimate fastener, capable of achieving a clamp load of 260,000 psi. Rod bolts are sold separately, please specify total number of bolts required when ordering. Rod bolts not for use as OEM replacement. BC Brian Crower connecting rod bushings are available for purchase as replacements to existing bushings that come installed in all new BC connecting rods. Manufactured from Aluminum/Silicone/Bronze material. Bushings are one piece billet and are sold separately as one only units. 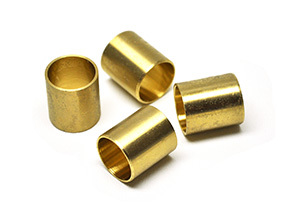 Replacement rod bushings are sold as a one only unit, please specify total number of bushings required when ordering. Some products listed are not legal for sale or use on emission controlled motor vehicles, RPM ranges vary on application.Warranty Information Copyright © Brian Crower Inc. All rights reserved.